Windows 10 was released on July 29, 2015 and from first impressions, it seems that it is making many Windows 7 and Windows 8 owners ditch their old operating system for this newly released one. We remind you that if you own a Windows 7 or Windows 8 license, you will be able to upgrade for free to Windows 10. However, when it comes to privacy, it seems that there are a lot of features that should be turned off on Windows 10 in order to make sure that you don’t share too much information with Microsoft. Before you fully install Windows 10, there are some ways to prevent this new operating system from accessing too much of your data. To do this, go to Express Settings in the setup process and pick the custom settings in order to block access to things such as location information, browser data etc. If you create a location account, you will be able to keep your data offline instead of storing it on the cloud via the Microsoft account. To do this, you will need to create a new account instead of signing in when you are prompted for your Microsoft account credentials. However, if you don’t link your Microsoft account to your Windows 10, you will not have access to OneDrive and it will be harder to sign into your Xbox account. For your privacy we suggest you disable your camera and microphone or select the application that can use them. To set your Camera go to Settings->Privacy->Camera and in order to set the microphone, just select the Microphone tab from the same window. 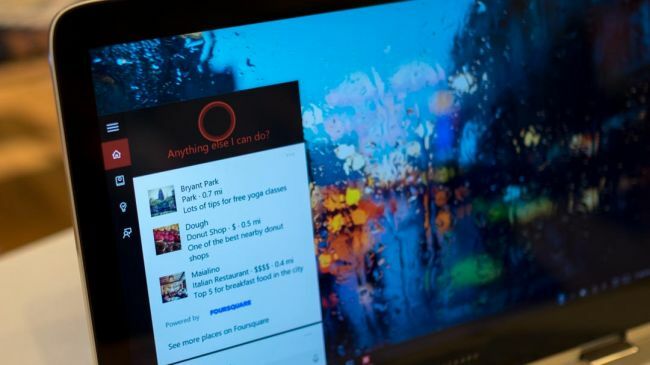 One of the best features that Windows 10 comes with is Cortana. This friendly assistant is very useful, but sometimes it gives the impression that it knows you a little too much. However, you can disable it with a few clicks by heading to Settings->Privacy->Speech, inking & typing and select “Stop getting to know me”. If you still want to keep Cortana for some quick vocal commands or searches, then you will be able to set what Cortana can access and what it’s not allowed. You can set Cortana to be able to access your Calendar, Messages, Contacts, friends and even your name and photo. However, we suggest you do not allow Cortana too many, that’s if you want your privacy to be safe. You can also clear your history from Cortana and Windows 10, but you will also need to visit your Bing account settings on the web. After logging in, you will need to wipe your personal information, interests and Cortana information. You should keep an eye on what information Windows 10 sends back to Microsoft but, at the same time, you should be aware of what other information your PC or laptop is sending over the air to mobile devices. For example, by default, the “Other devices” privacy settings will let your Windows 10 PC to automatically connect and share information with other computers, tablets and smart phones that you own. If you want to connect your mobile device with ease to your computer, you should select “Choose apps that can sync over the air” and this way, you will be able to dictate how data is shared between applications and devices. In order to help Microsoft improve their operating system, we suggest you leave it as it is. By turning this feature off, you will make your life harder, as you will not be able to report any bugs and glitches that you find. In this section, we suggest you to turn off as many applications as possible. This way, you will be able to save processing power and at the same time, you’ll prevent any data from leaking out of your system. By setting applications “On”, they will run in the background, transfer data over the web, send notifications, check for updates and more. Wi-Fi Sense is one of the most troubling features that Windows 10 comes with. This feature allows you to connect to suggested Wi-Fi hotspots and share a network connection with your contacts. In other words, Windows 10 has the ability to automatically join a wireless network and look for your Skype, Facebook friends etc. The point of this feature is that when you visit your friend’s house or place of business, Windows 10 will automatically sign into their Wi-Fi network that they’ve shared with you via Wi-Fi Sense. However, in our opinion, this is not very secure, because you will not be able to select the contacts that you want to give access to, anyone that you’ve talked on Skype with or you’ve emailed using the Outlook application, will be able to access the Wi-Fi network that you are connected to. To access the Wi-Fi Sense Settings, to go Settings->Network & Internet->Manage Wi-Fi Settings. We suggest you to turn this feature off, as you will be sharing the Wi-Fi credentials with all your Skype contacts, Facebook friends and Outlook contacts and whenever they are area around a Wi-Fi network that you’ve connected before, they will automatically connect to it, because you’ve shared that password without even knowing it (with Wi-Fi Sense).